So I removed some plastic and traced the trans oil cooler lines on my diesel last weekend. It appears that the only transmission oil cooler is the one in the bottom of the radiator. Seems like a stupid move to put an external one on the V6 but NOT on the diesel that is highly likely to be used for towing. I have seen short temperature rises to 230F (only for a couple of minutes) when towing the camper. It also runs around 210F for far longer periods in hot weather while towing that parachute. Even though this is within the specs for Dexron VI and the 6 speed trans, I would much prefer to keep things lower than this. Frankly the trans is a PITA to change fluid on, or even check the condition of the fluid, so prolonging the life would be nice. I had the service department print out the transmission service procedures from the computer if anyone needs them. Just wondering if anyone has installed an auxiliary transmission cooler yet, and where/how you mounted it? There doesn't seem to be much space in the area of airflow behind the upper grill unless I use a relatively thin cooler and place it between the intercooler and A/C condenser. Unfortunately, no... we do not! I personally removed the grill and a bunch of other plastic at the front and beneath the truck. 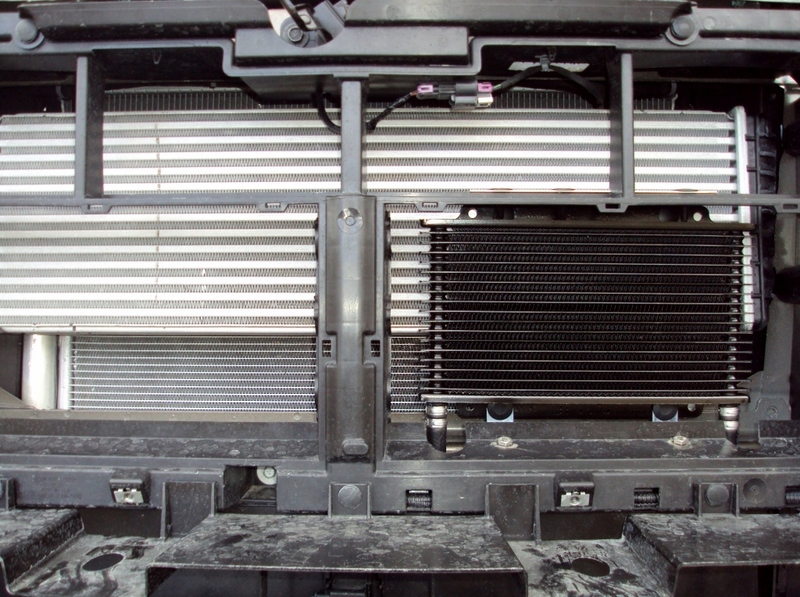 The V6 has a transmission oil cooler that is built into the top portion of the A/C condenser. The diesel does not have this. The intercooler sits in the area that this top portion would be on the V6 A/C condenser. I constantly run around 190-200 degrees in Phoenix without towing anything, and when I got into the dirt roads in the mountains I saw 218 in 4 wheel drive and 1st gear. I thought this was concerning but, I spoke with GM customer service and the dealership and from what they told me was "If the transmission gets hot, the computer will inform you on your dash to slow down and let it cool. If it doesn't cool off from slowing down and gets in the too dangerous to drive temp range, the computer will tell you to essentially pull over." I finally had to change the DIC off of the trans temp so I wouldn't worry about it. Id still like to see the trans run cooler though. I think that I read somewhere that it doesn't throw up the warning until around 260F. That is getting close to the limit for Dexron VI. The reports on this forum from the V6 guys seems to point to them running MUCH lower trans temps. I feel like GM decided to rely on the lower temperature of the engine cooling system on the diesel to give enough cooling to the trans. I watch the trans temp just so I can stop BEFORE it gets to that warning limit. I'm not freaking out about the occasional 230F for a few minutes, I sure would like to keep it a bit cooler than that. This truck was a MAJOR investment for me and I need it to last as long as possible. NameEtc. and 16WhiteColly like this. Have you considered mounting an auxillary cooler to the frame or a crossmember so it gets cooled by air moving underneath? Toughsox, mexica and madcratebuilder like this. That is a very good thought! The plastic, factory 'skid plate' has a cut out for air flow (not sure which direction). The lines go into the radiator right there as well. A mount could easily be made that would position a cooler above it and you could seal the sides to the plate to promote the air flowing through the cooler... hmmmm I wonder how much air flow there actually is in that location? A stacked plate cooler might be a perfect fit. Of course if the air is flowing out from the engine compartment you would be using hot air that already passed through the radiator. I think there is just enough space to get a plate-and-fin style cooler between the radiator and intercooler if it is small enough to fit above the condenser. About 8" tall I would say without taking a tape measure to it. But you would loose some efficiency in that location since you would be using air that has already been heated by the intercooler. The following diagram may help illustrating the transmission cooler location and its piping. green02crew and yammierider like this. After some investigating, I believe there is room for an auxiliary cooler right behind the grille on either driver or passenger side. So, is this showing that there IS a transmission cooler built into the lower portion of the radiator? 2016 Canyon SLE diesel, Brownstone Metallic, Towing Package, etc. Yes. At operating temps, the ATF will never get cooled below the temperature of the coolant. I plan to install an auxiliary transmission oil cooler. Not because I feel I need it but rather to see if it can be done. If anyone is interested, chime in and I will take pics. DiNoto, k7tnt, green02crew and 2 others like this. Do it. I may follow. I suppose you'd install it post radiator, right? Seems like you'd get the best temp reduction that way. Yes, that is the way that you install it... in series after the tank cooler in the radiator. You also try to place the cooler in the coolest air flow possible. Mine goes in this week for one of my free services. I plan to take a better look while they have it up in the air and see if any of the techs have any suggestions. I think it would work well to bend 3/8 or 5/16 copper/aluminum/steel line to curl under the radiator tank and drill two holes for it to pass through in the plastic air shield that sits in front of the radiator at the bottom. This way you could run the lines straight up to the cooler. They would look like a big "J" so to speak. ssgjurista... Do you happen to know which is the inlet and outlet on the tank cooler? Inlet (from transmission) on tank cooler is passenger side; outlet (back to transmission) is on the drivers side. Thunderbear and mexica like this. UR welcome! Cooler and plumbing items are on order. Will take pics of install. I'll be watching this too. Thanks for doing it! Teaser pic. More to follow. Canyon16Dmax, mexica, Eric Roberts and 1 others like this. Go to first new post New to the BowTie team! !